Bollinger's vineyards have Premier and Grand Cru status resulting in a full-bodied Champagne of great class. 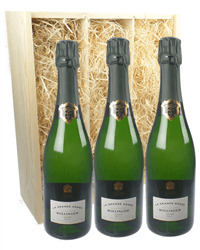 Our range of three bottle Bollinger Champagne gifts allows you the opportunity to select three bottles of the same or a mixture of Special Cuvee, Rose or Grande Annee Vintage Champagnes. Order online or by phone and we will deliver your gift, beautifully presented with your personal gift message.